At final count, we recorded 497 fossils in the 2013 Flat Rocks field catalogue. This does not include all of the "shoulder bones" (bones that we could determine were too incomplete to be of scientific interest) that we discarded at site or at the house. It does include a few fossils we labelled "microscope check" on site that Dave or Lesley subsequently prepared more and then discarded. Most of these fossils will go back to the Melbourne Museum where Dave Pickering will oversee their removal from the rock during the year. A few turtle specimans have gone home to Lesley's house to be prepared there. Lesley is working on describing our turtle (with some other scientists) and is keen to see as much material as she can before committing her conclusions to paper. A big thanks to our volunteers, Friends and sponsors for making this all possible. Travis Park, dig volunteer and Paleo PhD candidate, has started a blog talking about Australian fossils and other things. His latest entry describes the week he spent with us at Flat Rocks. Check it out! As promised, photos of Mary Walter's new baby grandson Aden. I took a few short videos on February 3rd when we had the jackhammer down on site. It was the second day of the dig and we were still figuring out exactly how we were going to attack this year's target fossil layers. 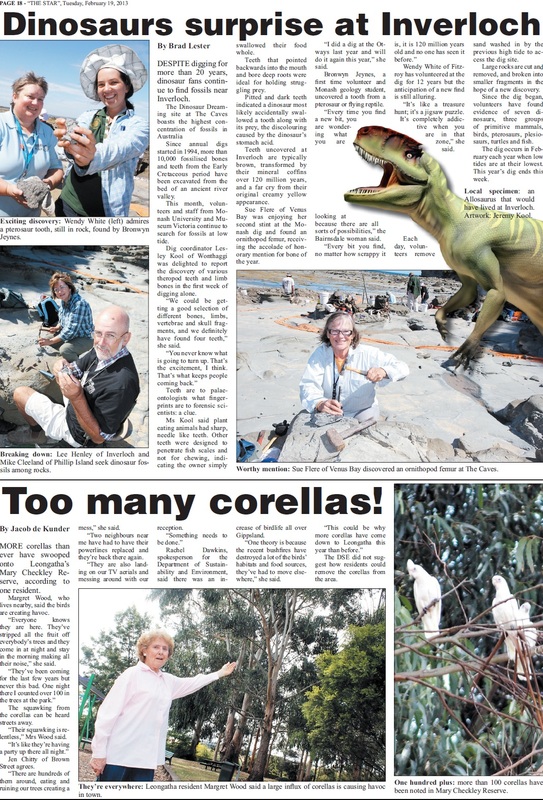 For those unlucky enough not to get the Gippsland edition of WIN News - here's their story featuring a number of your favourite people looking for dinosaurs. http://thestar.com.au/?p=6489. Here's a copy of page 18 that Brad (the editor) was kind enough to send me. Sunday 17th Feb was Friend's Day. 71 supporters of Dinosaur Dreaming visited the site and watched us dig and jackhammer.